This image was taken yesterday at the Port of Los Angeles, with the "Benjamin Franklin" - the largest container ship ever to dock in North America - in the background. 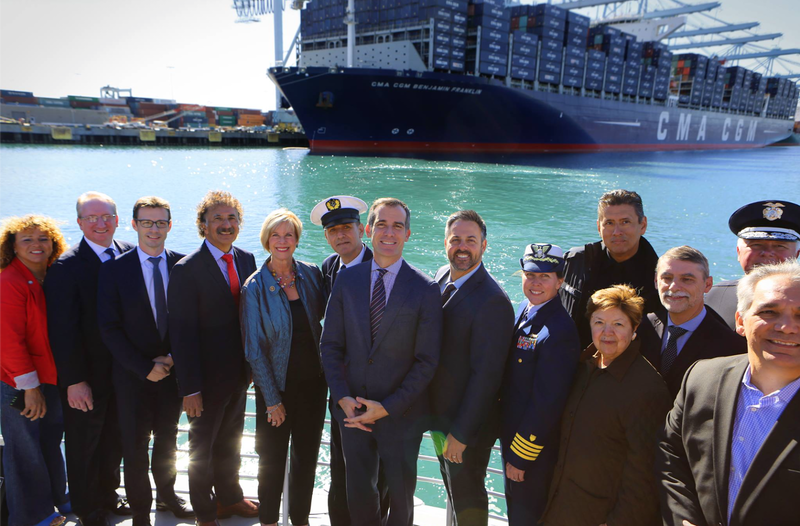 In the foreground we see Eric Garcetti (seventh from our left), the Mayor of Los Angeles with thirteen other individuals. From a body language perspective, Mayor Garcetti is configured in a manner which is the very antithesis of a strong or confident leader (and particularly ironic given the layered metaphors here). Take note of the position of his hands. This is what is known as the "Fig Leaf" or "Genital Guarding". While there are certainly scenarios when a "leader" (elected or otherwise) should stand with hands in a fig leaf (e.g., at a funeral, wedding, religious service, when meeting major religious figures, ceremonies involving receiving the remains of soldiers) - the VAST majority of the time, those who are in a leadership position should NEVER stand in this manner for it projects beta and acquiescing emotional tones. And moreover, not only will others perceive these feelings - but this body language will truly engender low emotional comfort, low confidence and low assertiveness. The body and face will thus act as a control panel, changing our neurochemistry and telling our minds how we will feel. How should Mayor Garcetti's hands (as well as the remainder of his body) be positioned? What other body language critiques can you make regarding this photo?